This item is Non-returnable; all sales final. 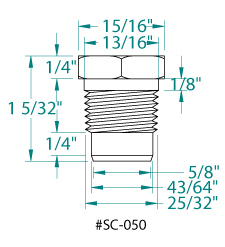 WARNING: Threaded Fitting sizes are often confused because the actual size of the threaded section is larger than the “Nominal” size given to name the part; see description and diagram for details. The sensor is wired into the system and signals the controller unit with readings on the pool water temperature. NPT: the threads are nominal ½" and actual threads 26/32” tapered to 25/32”. This model is typically screwed into a ½” female bushing inserted into a Tee fitting. To determine the type of sensor, the resistance must be measured in ohms using a volt/ohm meter when the sensor is at 77ºF. Product Manufacturer: Hayward Industries, Inc.